Our Volunteers were very busy in the gate area over the last two weeks of August, removing another 2 potential problem trees, another Field Maple and an Alder. 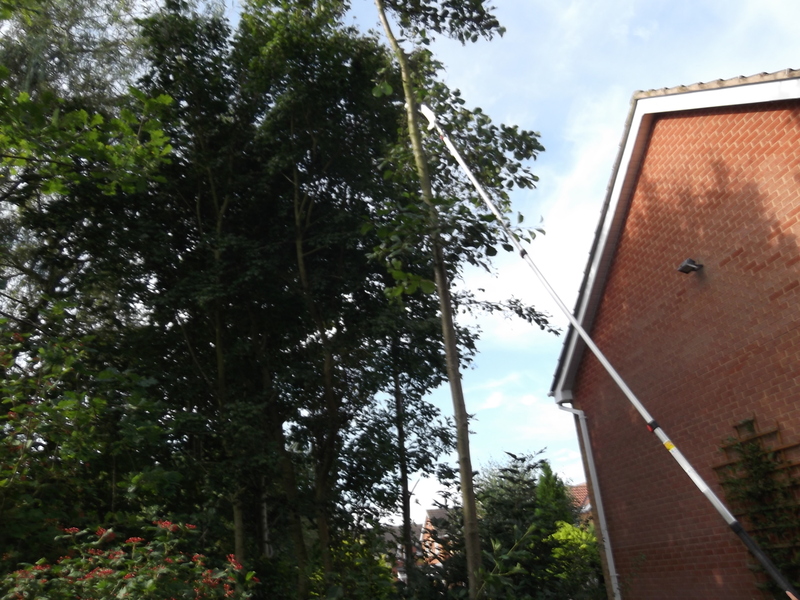 As you can see from the photo the alder had a single stem taller than the adjacent house and had started to lean. The lanky unsightly growth pattern was a consequence of excessive competition and neglect in earlier years. Removal has now improved growth conditions for adjacent oaks… We’re lucky that Dave Moore (below), an MCT Trustee and volunteer, is an experienced arborist excellent at this type of work. 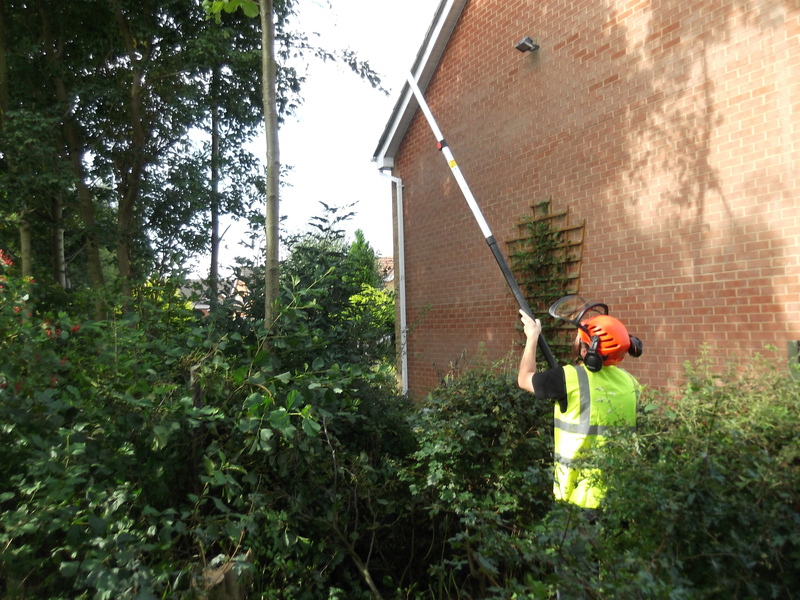 Under the terms of our license this type of work has to be done from the ground using pole saws to reduce the canopy weight prior to felling. 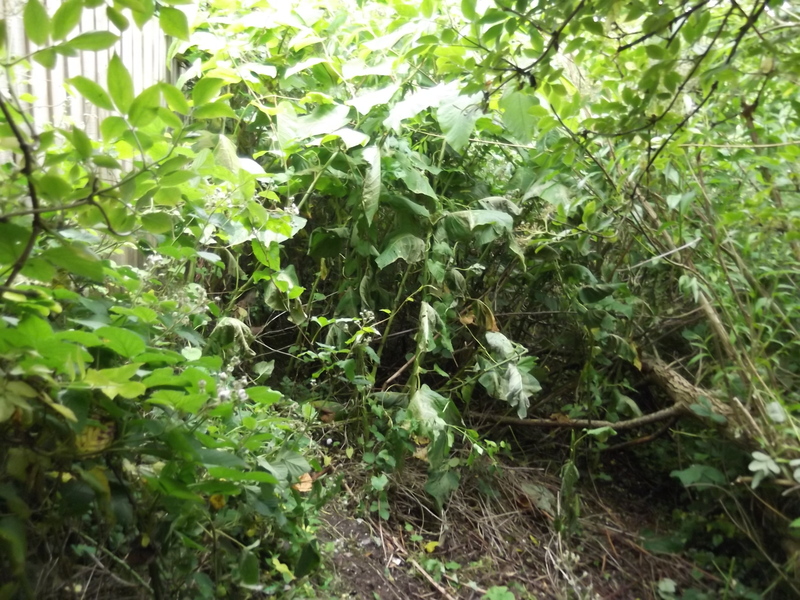 Our volunteers incinerated more treated and dried Japanese Knotweed on the 17th and felled one of the excessive number of large Field Maples that was a potential danger to an adjacent house by the gate on 18th August. MCT is committed to community involvement and community activities. Therefore the Chair, Margaret Silcock, loaned the MCT Gazebo (funded by the Dringhouses & Woodthorpe Ward Committee) to the neighbouring Woodthorpe Community Group for their Fun Day of August 13th. 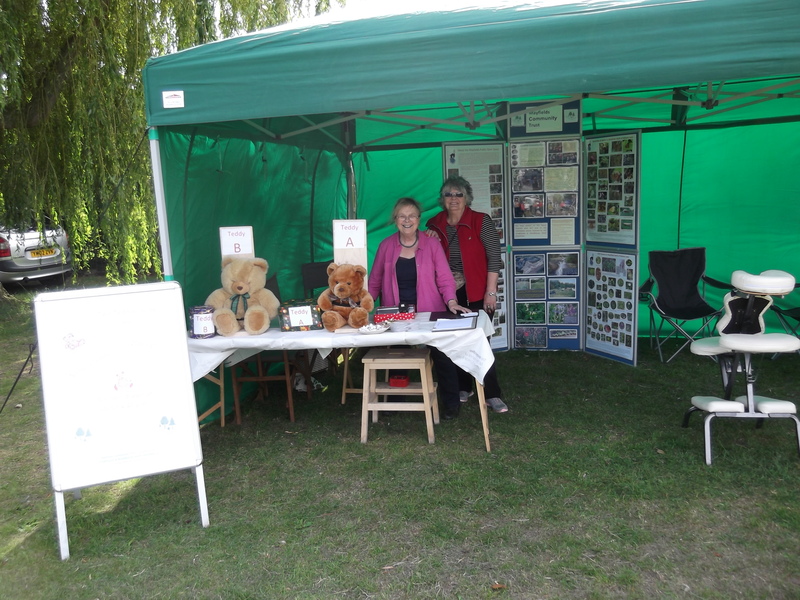 She purchased 2 super teddy bears to run a “Name a Teddy” competition and sold tickets on the MCT display end of the stand on the day. Money raised went to the St Leonard’s Hospice. 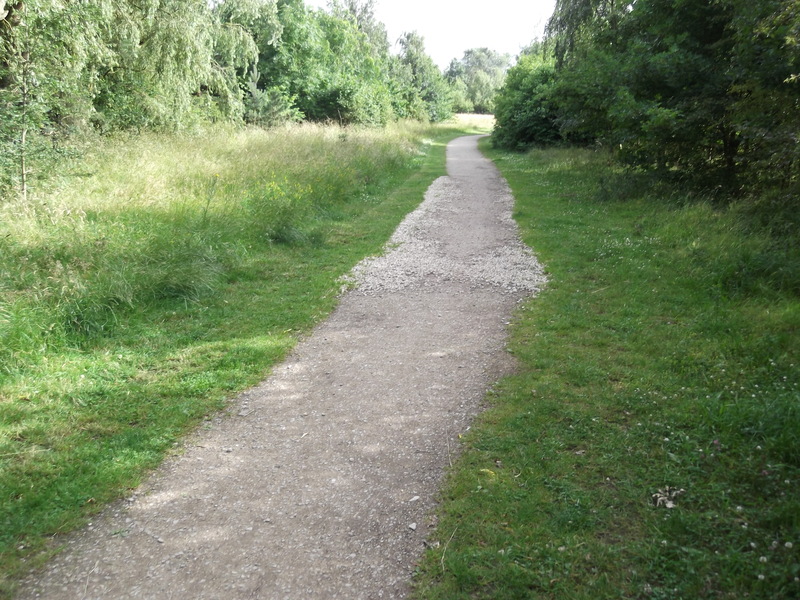 We’ve been busy in the first half of August, strimming/mowing beside Nelsons Lane and the main path, thinning oversized vegetation near the gate area, crushing over-sized pebbles/gravel on the path edge to improve the size distribution and laying a concrete base for the Tool store on the site funded by the Dringhouses & Woodthorpe ward Committee. 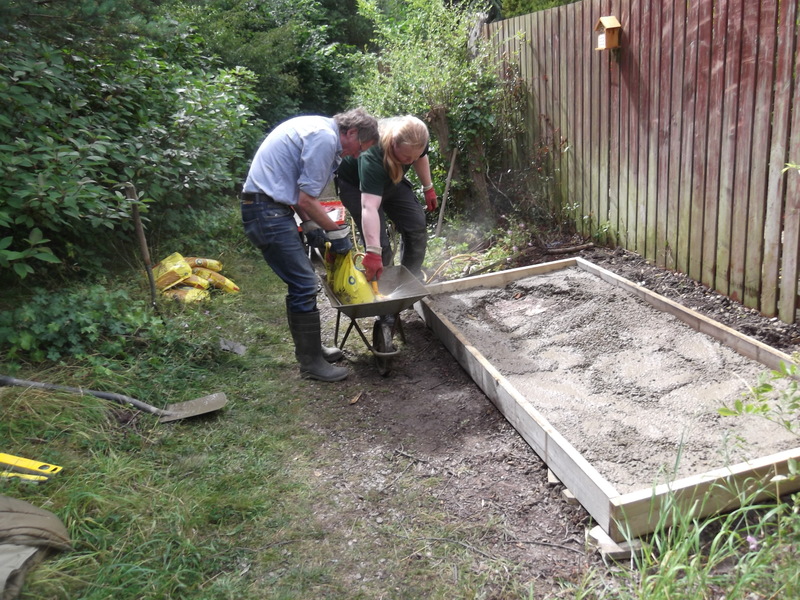 Our volunteers finished the base on 15th August having used 39 bags of concrete in total, so the storage shed has now been ordered. 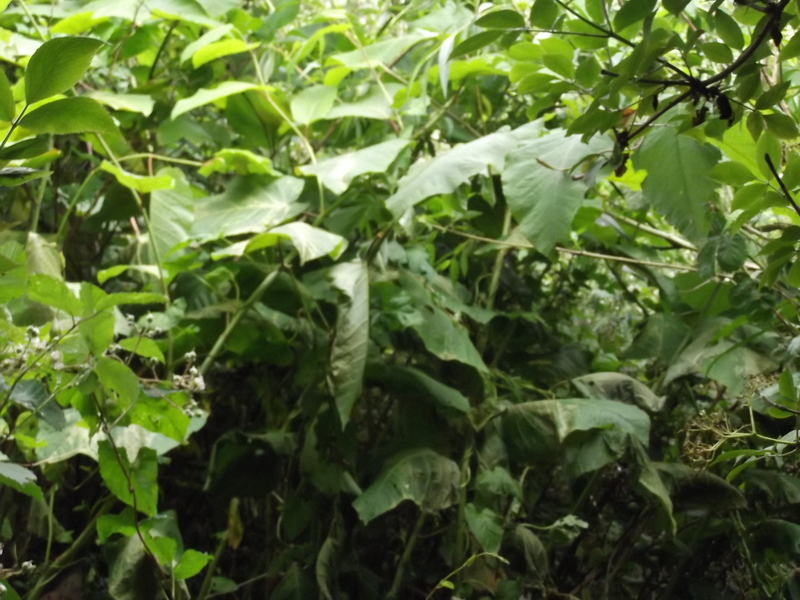 We have also been helping CYC eradicate the Japanese Knotweed patches on the adjacent woodland going towards Little Hob Moor. More than 160 membership application leaflets have been picked up from the box on the noticeboard by the gate, but so far this has only resulted in 3 new MCT members. Still never mind – every £5 is put to good use in helping maintain and improve the Mayfields Public Open Space. The impact of the prolonged dry period on the grasses on the site has meant that we had to start trimming some areas earlier than usual in the year. 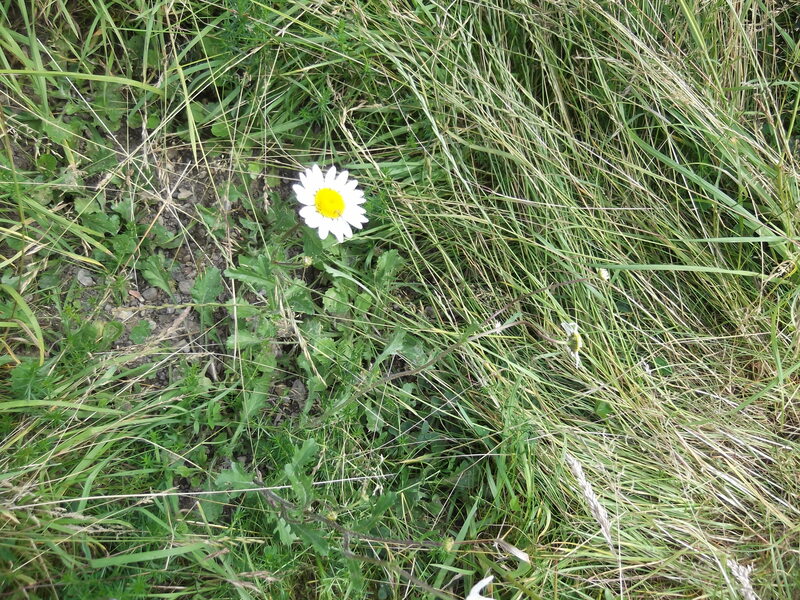 We try to skirt around residual patches of deeper-rooted wild flowers still in bloom. Towards the end of July we received a grant from the Dringhouses & Woodthorpe Ward committee of CYC towards installation of a tool store behind the west bund. In hopeful anticipation we removed a patch of overgrown Pyracantha a few months ago before the nesting season. Adam and Malcolm dug out the roots on 28th July and levelled a marked out area for installation of a concrete base sometime over the next 2 weeks. The store will be smallish at 7 ft by 3.5 ft, but more than adequate and should be unobtrusive once finished. 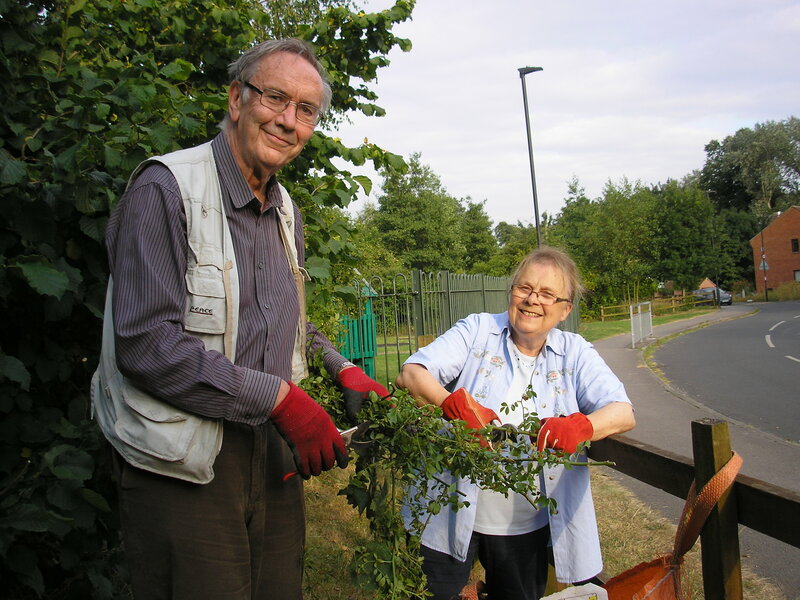 Seven turned out for the MCT Friday evening volunteer session at 7 on July 22nd, so we got a lot done, both near the gate and at the bluebell dell end of the site. It was a very pleasant sunny evening as Pam’s photo of 2 of our volunteers shows. 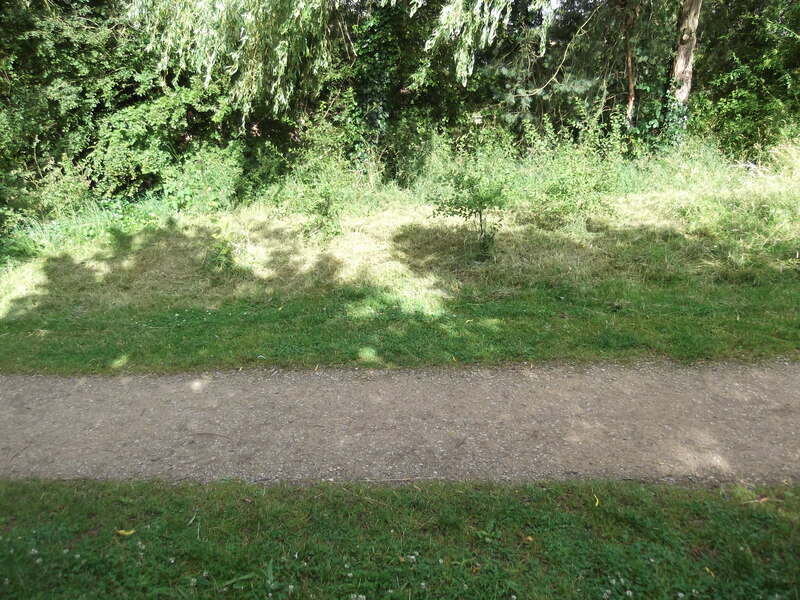 Adam and Malcolm trimmed overgrown shrubs and hazel near the gate and in the woodland beside the playground on 21st July. Partly this was for safety reasons and partly to improve conditions for trees such as some Alders that were being overcrowded. We always check for nests first though at this time of year. A quick reminder that our summer volunteer sessions start at 7 in the evening on Fridays. The next will be on July 22nd. Quite a bit of mowing of path verges needed between showers at this time of year; we also reduce grass competition around newly planted trees and shrubs for the first year or two. On Friday June 15th, 2016, Louise, Lesley, Harriet, Paul and Malcolm reduced an overgrown Hazel and Guelder Rose that were at risk of Damaging Scots Pine and Oak trees that were growing too close by. The long hazel poles were woven into the dead hedge the following Sunday morning. You can see a wee video of their efforts on the Mayfields Community Trust Facebook page. 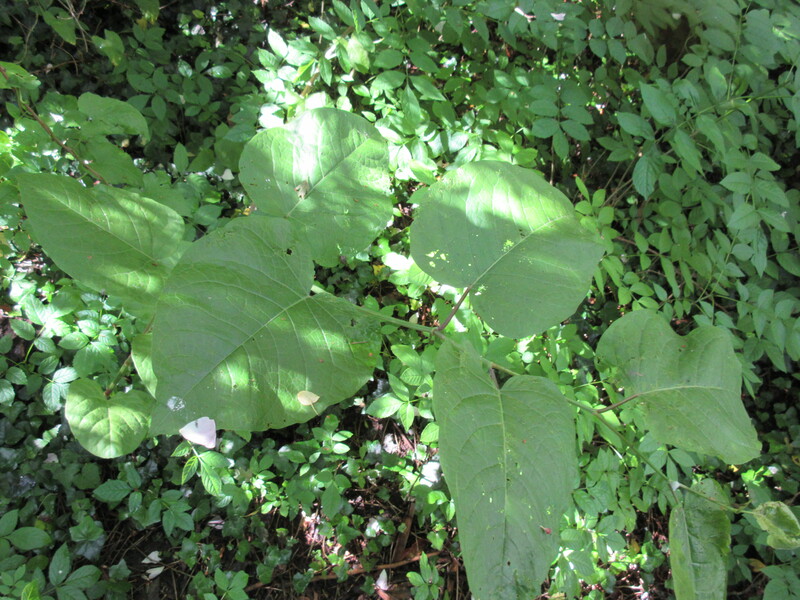 We have succeeded in eradicating Japanese Knot weed from the area that MCT manages officially. 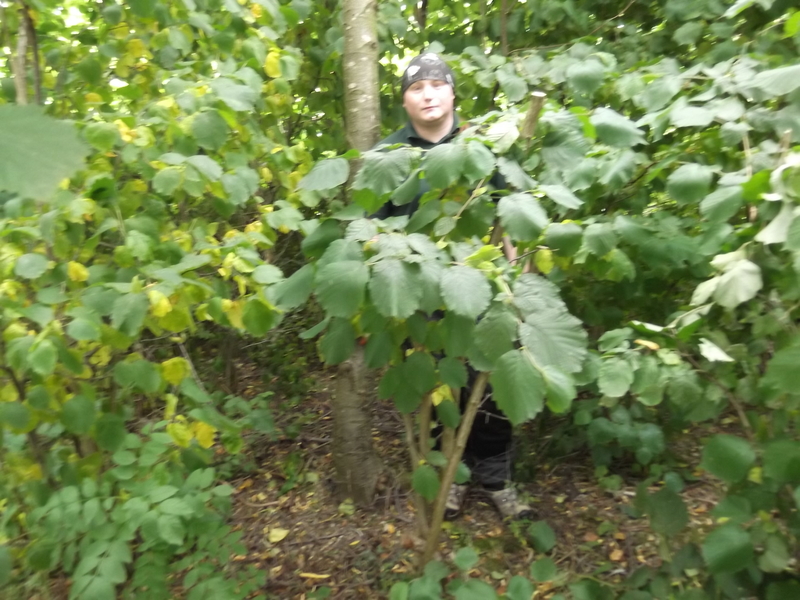 MCT volunteers are now attempting to do the same on the woodland area between our site and Little Hob Moor for the City of York Council. Behind the north end of Goodwood Grove there are some quite substantial patches, with smaller patches elsewhere. They will be sprayed 3 to 4 times at intervals and dead material will be incinerated. We will continue monitoring for at least 3 years. and the day after first treatment in dry weather. It was a pleasure on 4th July 2016 to see the Ox-eye daisies that MCT raised from seeds to produce plug plants to enhance the meadow starting to flower. These were planted by Margaret Silcock, the MCT Chair, and Lesley Abbott at an earlier volunteering session. They should soon spread if we keep reducing the dominant grasses.